If VMware vCenter 5.1 is installed with a local administrative account and not a domain account, then, when trying to assign permissions in vCenter via the vSphere Client or vSphere Web Client, the Active Directory domain will not be listed as an option. Note: To just get Active Directory permissions available via the vSphere Client, 2.1 and 2.2 are not required to be done, just 3. 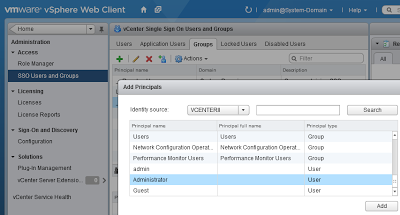 This step is only required so can log into the vSphere Web Client as Administrator to manage permissions etcetera. 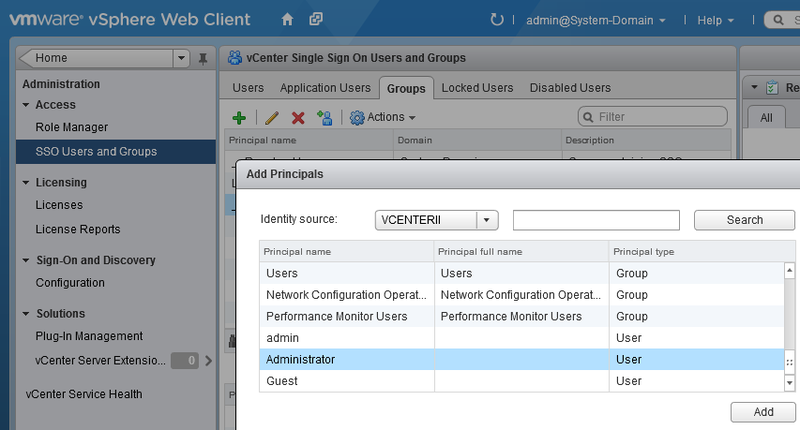 Now, if you log into the vSphere Client or vSphere Web Client as the local Administrator account, you will be able to grant permissions to AD Accounts! Note 1: If you log into the vSphere Web Client as admin@system-domain, you will see 0 vCenter Servers and this is normal. If wanted the vCenter Server(s) to appear in the vSphere Web Client when logged in as admin@system-domain, then just give the admin@system-domain account some permission to vCenter. Note 2: With the very latest version of VMware vSphere vCenter 5.1, trying to install vCenter SSO when the vCenter is on a domain but logged in locally, will present the following warning. Note 3: Trying to install vCenter on a machine in a workgroup presents a different warning. This happen to me recently, and this is good solution!